My second granddaughter Becki was given this lovely old quilt by her Aunt Donna when she was getting married last year to Jeremy. It was made by someone in her grandfather's WEST family. 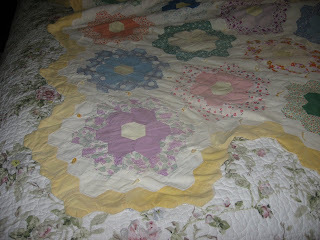 It is made of 30s fabrics, a generous full size summer quilt, tied with varigated yellow threads. There is no batting. The second picture shows the edges of the quilt. All four sides have been whip stitched to the backing along the yellow border. When I did a bed turning last week for the Campfire Girls there were a lot of Ohs and Ahs when this beauty appeared. 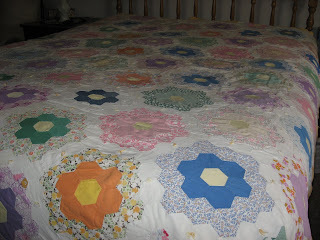 On my bed I layered my baby quilt, made by Grandma Gaylord, a Basket quilt also made by Grandma (that is on an early page of this blog), two of my first quilts, my Christmas Disappearing 9 Patch and this Grandmother's Flower Garden. Now back to sewing on my Scrappy Bargello. I have it half done and the third quarter is ready to be cut into strips and sewn together. I'm debating whether or not to make the braided border. Yesterday I took a day off and sewed a bag for the Bags, Purses and Totes Challenge for Chenango Piecemakers Guild's annual picnic challenge tonight. Now to decide dish to make for the picnic.